Villa Lega is a Bali beachfront villa in Batubelig, Seminyak. This double-storey has its own beach which seamlessly corresponds with the villa’s architecture. Villa Lega is designed as a comfortable and chic home away from home, catering to family and groups of friends with its five luxury bedrooms. 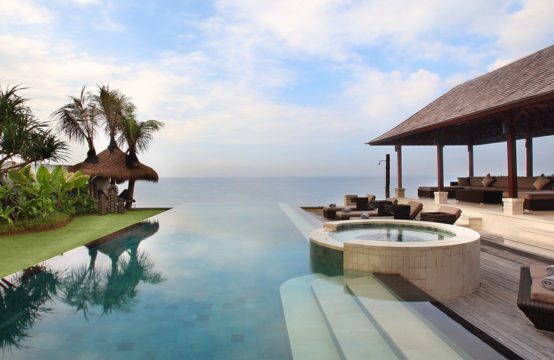 Villa Lega brings in the sea, the great Indian Ocean, into its own realm with its central, 12-meters swimming pool. The expansive pool environment soothes guests through the application of eight all-weather white loungers, roomy wooden deck, and double daybed with red cushions. An outdoor shower is available close by and a water feature helps soothing the mood. When it comes to the enjoyment for the eyes, an upstairs deck is the best place from where guests can view the Indian Ocean unobstructed. And when it comes to the ears, the perpetual sounds of the waves can be a spell to bring guests to the sound sleep. For this, the five luxury bedrooms of this remarkable beachfront villa are the ideal beddings, with the huge king size beds, en-suite bathrooms and lavish amenities, all polished with colorful walls. Among those chic bedrooms, there is a smaller bedroom upstairs. Here, the children can have their share of the memorable sleeping experience, all in highly private setting, and enjoy a true family’s home away from home. Each of the five bedrooms at Villa Lega is spacious, bright and extremely comfortable. Original paintings adorn the walls and objets d’art add Balinese charm. All have immaculate ensuite bathrooms, dressing areas and floor-to-ceiling glass doors, and each is accented with silks and soft furnishings in its own unique colour scheme. All bedrooms are furnished with romantically canopied king-size beds and writing desks, and equipped with satellite-channel TVs and DVD players. Upstairs, two very generous master bedrooms feature sitting areas and private balconies with sea and garden views. A king-bedded guest room lies to the rear of the top floor and, although it doesn’t overlook the ocean, it is a lovely comfortable room with soaring roof and warm timber floor. The two downstairs guest rooms open onto the pool and are mirror images of each other, both boasting king-size beds and semi-outdoor ensuite bathrooms with tubs and showers. Villa LeGa’s generously sized living and dining room has a marble floor and folding glass doors that open to the pool deck, offering guests the choice of air-conditioned comfort or tropical open-air living. The living area is furnished with a yielding L-shaped sofa and a glass-topped coffee table in front of a large flat-screen TV, while the dining area boasts a handsome solid wood dining table for 12. A state-of-the-art, open plan kitchen and breakfast bar fits in neatly to the rear of the living and dining space, and a guest washroom is located to the side. Adjacent to one of the upstairs master bedrooms is a comfortable, air-conditioned TV loungefurnished with soft couches and equipped with a large flat-screen satellite-channel TV with DVD player. Curtains on all sides shut out the sun for daytime movie viewing and give privacy to the bedroom next door. The TV lounge can also be accessed from a balcony that runs the length of the first floor. A splendid upper-floor sun terrace, furnished with a selection of all-weather armchairs, sofas and sun loungers, takes pride of place at the front of the villa, while a more intimate spot for sun worship lies above the villa entrance. Both offer absolutely magnificent ocean views – especially at sunset.